Like for a Pencil Charity Giveaway! Mom for a Cause Blog is running a giveaway contest in her blog. It is a charity giveaway wherein all LIKES that will be generated from November 1 to 7 for the "Mom for a Cause" Facebook page will be translated to one pencil. The pencils will be donated to “Paper and Pencils for a Cause” which is a personal charity drive of Mommy Jade’s family wherein they give out paper and pencils to the students from Estrella Village Elementary School, located in Narra, Palawan. Aside from the pencils, she will also be giving away $5.00 to four Likes of the FB page. 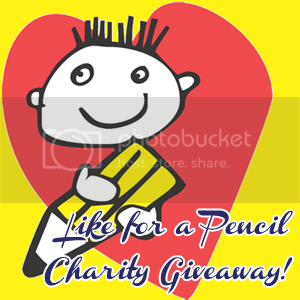 I have joined the giveaway and making a blog post not because of the chance to win $5.00 BUT to help spread the word about this Charity Giveaway in the hope that there are people who would be interested to LIKE the Mom for a Cause FB Page so more pencils will be generated to be given to the students of Estrella Village Elementary School. This would be my own little way of extending my help. If you are interested, please head on over to Mom for a Cause Blog for the mechanics. What are your Rights as a Breastfeeding Mom? Update: Like for a Pencil Charity Giveaway!